Wild, natural, fresh and delectable - the taste of Barnes Wild Bluff Oysters is like no other. It’s the unique combination of great depth, arctic temperature and pristine purity of our southern waters that bestows supreme flavour to the deluxe, succulent meat of our famous delicacy. 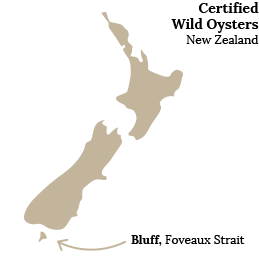 Renowned for their prestige as much as their incomparable taste, and packed with the goodness of minerals and vitamins, Barnes Wild Bluff Oysters are enjoyed throughout New Zealand and across the world. As proud New Zealanders we take the state of our country’s environment seriously and strive for continuous improvement in all areas of our business, from fisheries management to environmental and economic sustainability. We recognise the needs of our customers while working hard to minimise any risk of damaging our environment for future generations.